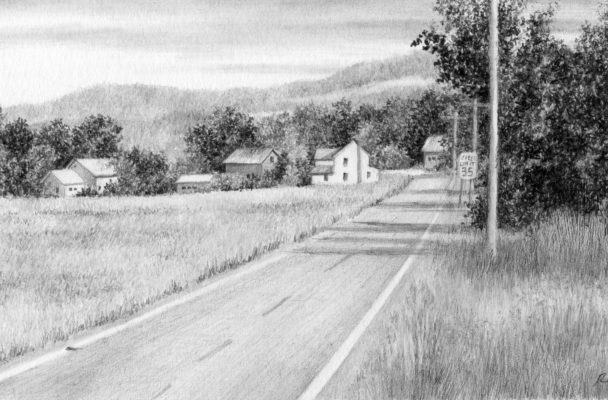 The drawing comes alive… and then just like that it’s finished! When it comes to my drawing and painting process an accelerated video time lapse would definitely be more interesting than watching my process from start to finish in realtime. You see, my style is cautious and tentative as I move slowly and deliberately around my drawing or painting toward building my image. I might step away from time-to-time to get a hot cup of coffee and upon my return with a fresh eye issues sometimes are revealed. That’s when those things I didn’t see before can be corrected or rethought. I’ve come to believe that each piece of artwork takes on a life of its own starting with that first glimmer of inspiration. It might be some beautiful landscape that catches your eye or perhaps a deliberately arranged still life or maybe the face of someone you love. It all starts when that inspiration stirs inside our mind’s eye. 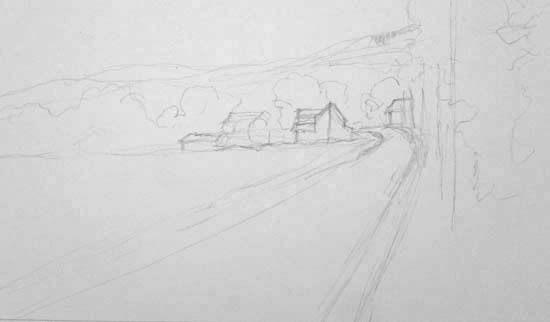 The next step can include prep work, i.e., value sketches and color studies, maybe a practice piece or two. Then again maybe you like to plunge in. “Just Do It” as Nike likes to say. In art there is no “right way.” Our creative voice is our own to explore and evolve. 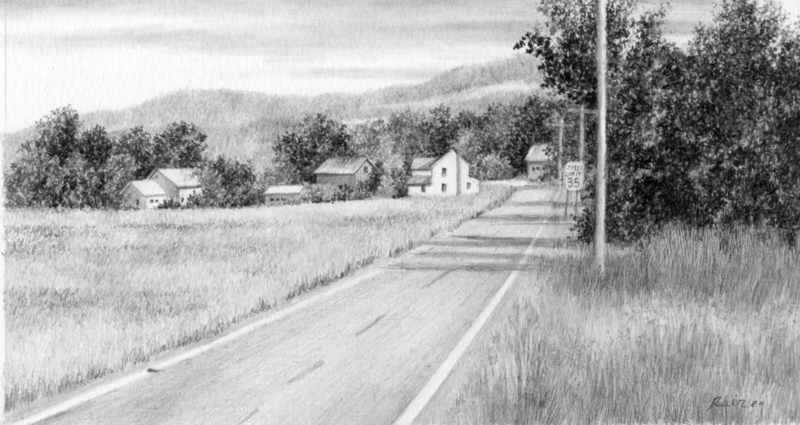 This pencil drawing “Village Speed Limit” inspired me because little communities nestled in a bend in the road are romantic to me. Lives being lived where everyone knows who you are. I image a small tight-knit group of people caring for one another and snooping into each other’s business (in a loving way, of course). My imagination takes me where I want to go with it… I am the writer, creator and storyteller as pencil moves across paper. And then before you know it you are finished. Sometimes your finished piece of artwork is good and sometimes it’s not what you originally imagined. 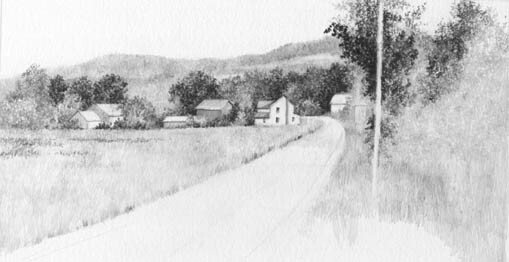 One thing is certain, with every painting or drawing you learn and that knowledge is compiled over time. Eventually with practice and patience you will end up with more pieces of artwork that you like and less of the ones you toss out. 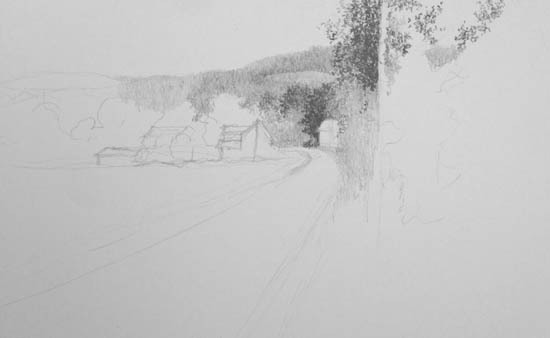 Whatever your style, whatever your inspiration, I encourage you to grab a piece of paper and a pencil and begin. The best fruit is out on that limb. Go for it and begin your search for your own personal, one of a kind creative voice.